Free collection letter samples and sample debt collection letters to get your debtor’s attention and help you collect your money without using a collections agency. View our database of free collection letter samples (dunning notices) and sample debt collection letters that you can use; just cut, paste, and fill in your information and send. These collection letter samples can help collect your outstanding balances without having to use a collection agency. Please be sure that all of your customer’s account information is accurate and up to date. You should always be specific about the date they owed you the money, what the outstanding balance is, how late they are, and any late fees or interest charges. The clearer you are the better chance you have of being paid, and you are building an accurate paper trail if account ever makes it to litigation. In your final sample collection letter, you must inform the customer what consequences there are, and when, for not paying now. For example: If your payment is not received by , your account will be sent to debt collection agency. You should not threaten to use a collection agency, report to the credit bureaus, or take legal action unless you prepared to follow through with them. 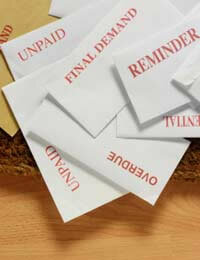 You should never send any additional collection letters out after your final one. Turn it over to the collection agency and move on. There is no room for shades of gray here – be black and white.